A second post in the short history of DD: this one about the DD V1 Boxed Set. 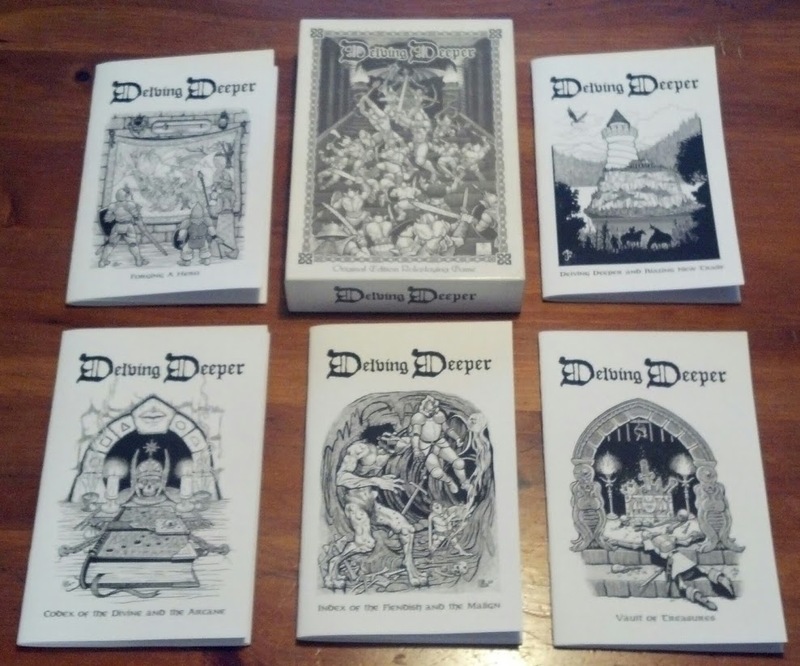 Shortly after #DelvingDeeper appeared in PDF format Brave Halfling Press launched the Delving Deeper boxed set, in December 2012, as the physical manifestation of the #DelvingDeeper project. I don’t personally own a set, but have gathered the following from public information posted by the producer and fans who own sets. 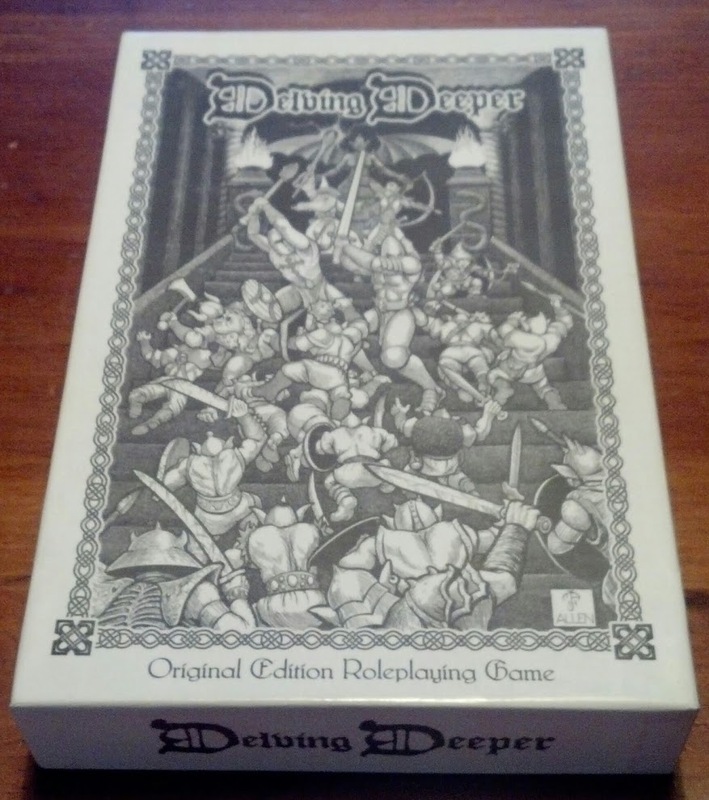 The whole product was packaged in an excellent, digest-sized box entitled “Delving Deeper” with the subtitle “Original Edition Roleplaying Game” and featured super impressive cover art by Mark Allen. Delving Deeper Boxed Set by Brave Halfling Press. (Picture courtesy of +Bill Lackey). The Delving Deeper box and the five booklets it contained. (Picture courtesy of +Bill Lackey). The #DelvingDeeper boxed set booklets were a re-organised presentation of #DelvingDeeperReferenceRules V1 content. 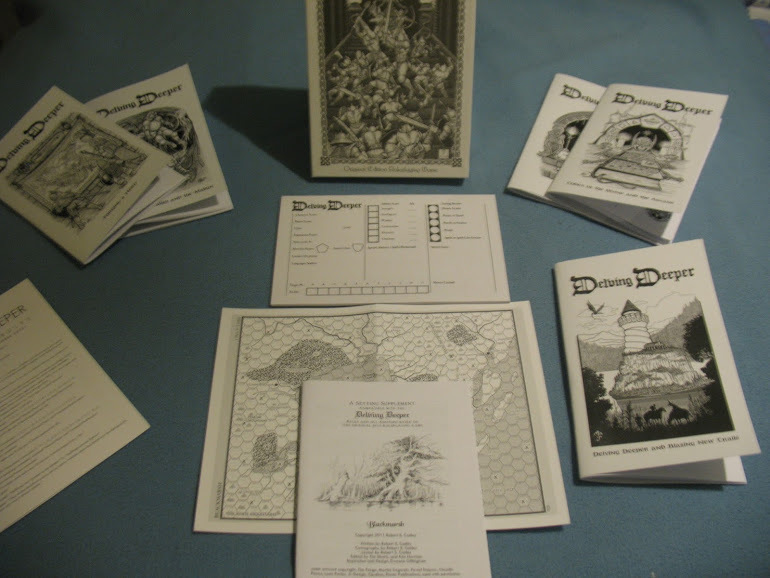 The tables generally looked nicer and, unlike the #DelvingDeeperReferenceRules, the Delving Deeper boxed set booklets were fully illustrated by Mark Allen. The back cover of each booklet states “Special Limited Edition Boxed Set – December 2012”. The boxed set, booklets, and additional freebies provided by Brave Halfling Press. (Picture courtesy of +Todd Jolly). Note especially the Blackmarsh booklet (bottom center) and also the Delving Deeper V1 Errata (bottom left). Thanks to +Andreas Davour for some of the above details about the boxed set. Welcome to 2016, and welcome to this first level dungeon. This was put together with Original Dungeons & Dragons in mind, but should work seamlessly with any of its modern simulacra including of course #DelvingDeeper. Enjoy! 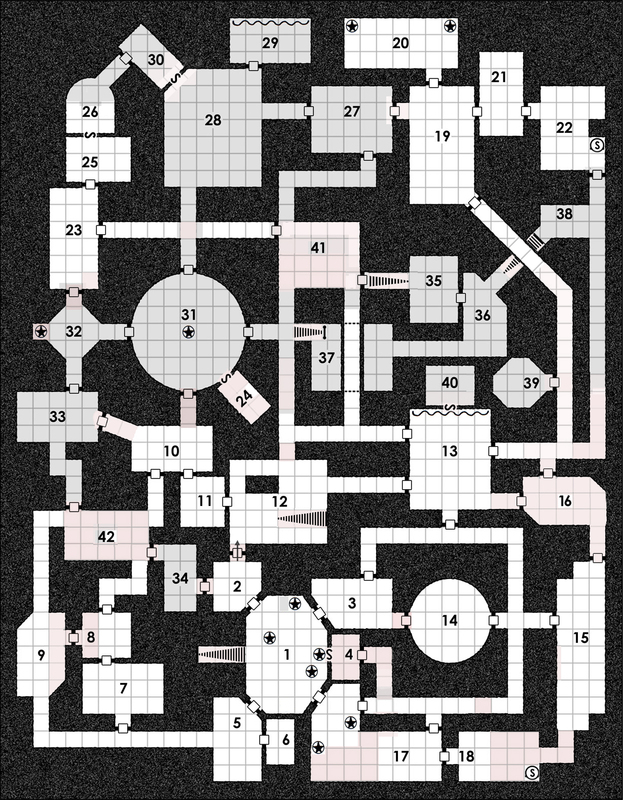 This dungeon level map is based on of one of Tim Hartin’s Friday Freebies. Tim’s original can be seen here with the local modifications indicated in red below (more about that in another post). Note: Players will first enter the dungeon at ROOM #12. ROOM #1. [Treasure + monster] A foul(!) Cockatrice [AC 6 MV 9/18 HD 5 C] has crept up from the lower levels and petrified several bandits who dared come this way. Spilling from split sacks around the perimeter are 1800sp and 800gp. However, five pieces of jewelry can be prised from the statues–and the monstrous guardian–worth 400gp, 1000gp, 2700gp, 2100gp, and 2000gp, respectively. The stair descends to a lower level. ROOM #2. [Empty room] The northern door is a one-way turnstile; it can be used to pass from here into room #12, but it does not permit egress from #12 into this room. ROOM #3. [Empty room] a sparse room with nothing to offer beyond a faint scent of limestone. ROOM #4. [Empty room] A closed room. There is a secret peep hole through which a (partially obstructed) view of room #1 can be had without any risk of being petrified by the cockatrice. ROOM #5. [Monster] 2-8 giant leeches [AC 8 MV 3/6 HD 2 N] persist in this damp chamber. They are initially clinging to the ceiling, dropping down onto any who do not look up as they enter. ROOM #6. [Empty room] A small, dark room with drips falling infrequently from the ceiling and an inch of standing water on the ground. ROOM #7. [Empty room] A modestly clean and comfortable room. The north door has not been opened in ages. ROOM #8. [Empty] Mabyagzeurg (see room #9) has laid a host of eggs here, which variously stand or cling to the floor and walls via her webs. The door to #9 is open and so choked with silk as to be a web funnel. ROOM #9. [Treasure + monster] Mabyagzeurg, a terrible giant spider [AC 5 MV 3/12 HD 4+4 C], lurks here amid a pitch dark tangle of lines and webs of sticky silk. She will wait for the players to make a route through her lair, striking only at the last figure. Her treasure is 1200sp and 1000gp scattered throughout the room. The door to #8 is open and so choked with webs as to be a web funnel. ROOM #10. [Empty room] A perfectly plain room. The western door is cool to touch. ROOM #11. [Empty room] A curious room in which the floor is painted yellow. ROOM #12. [Empty room] The stair here ascends to the upper world. The southern door is a one-way turnstile; it can only be used to enter this room from #2; it does not permit egress into #2. ROOM #13. [Treasure + monster] 2-12 callous brigands [AC 7 MV 12 HD 1 C] are here despite half the group recently making off with most of the treasure. The brigands are fiercely upset about the mutiny and are plotting a counter move. Their remaining loot is hidden in a secret room #40 behind a tapestry, accessible via a removable wooden panel. ROOM #14. [Empty room] An echo chamber. Every sound seems nearer and clearer here. A figure standing silently and listening here can–each on a successful listen at doors throw–hear the cockatrice clucking in #1, the rats twittering in #17, the bandits whispering in #17, and the brigands muttering in #13. ROOM #15. [Monster] 2-12 Bandits [AC 7 MV 12 HD 1 N] have broken away from the main group of brigands (#13) to hole up here. They suspect the brigands (see #13) will move against them soon, so they have hidden their treasure in room #18. They know there is something terrible in room #1. ROOM #16. [Trick/trap] Two dozen battered old shields and helms, broken pieces of armor, and pots and pans dangle from chains, filling the room with potential alarm bells. Should anyone–or even so much as a decent breeze–move through here, they will make a clatter, forewarning the bandits at #15 and the brigands at #13. ROOM #17. [Monster] There are several rat-statues here, petrified by the cockatrice (see room #1). 2-12 live giant rats [AC 7 MV 12/6 HD 1/2 N] abide amongst the rubbish, mainly at the eastern end of the room. ROOM #18. [Treasure] The bandits (see #15) have buried 1800sp and 600gp in small sacks beneath a couple of loose flagstones in the south-east corner of this room. ROOM #19. [Monster] 2-12 orcs [AC 7 MV 9 HD 1 C] are stationed here, maintaining an uneasy truce with both the anti-clerics (see #36) and the Wizard’s mercenaries (see #28). The orcs barrack in room #20. ROOM #20. [Empty room] The orcs stationed in #19 and #22 barrack here. ROOM #21. [Empty room] The orcs’ larder. Barrels of sour wine, rough ale, and drying fish. Sides of mutton, bins of weevily black bread, wheels of hard cheese, and so on. ROOM #22. [Treasure + monster] 2-8 giant orcs [AC 6 MV 9 HD 2 C] are stationed here, holding the south passage against any intruders. Guzaag is a minor hero-type figure among them (3 HD, FC hero-1) not leastwise because he carries Jitterhex; an unintelligent enchanted broadsword +1, +2 vs men. The orcs’ treasure comprises 1500sp and is hidden in a locked chest buried below the flagstones (marked S on the map). Guzaag has the key. ROOM #23. [Treasure + monster] 2-12 greedy dwarfs [AC 4 MV 6 HD 1 N] are here, counting out the silver they have won from Amedeo’s mercenaries (see #28) and scheming on how they will get more silver out of the wizard himself (see #26). Duffr, the eldest and wisest amongst them, is under Amedeo’s charm and councils the dwarfs accordingly. All told the dwarfs have accumulated 2000sp. ROOM #24. [Treasure] The door to this secret treasury can only be opened by making the statue in room #31 point in a south of south-west direction. The door will snap closed as soon as nobody remains in room #31. If all the players are in this room when this occurs, they will be trapped here. There is a desiccated corpse of a would-be-robber who starved in similar circumstances, and the small chest and three sacks he up-ended and spilled in his frustration. All told there are 800gp and 1600sp scattered about. ROOM #25. [Monster] Quarters for a gentleman of modest means comprising a four-poster bed with mosquito net, a foot locker containing a change of clothes, a vanity, and a night stand. The whole is illuminated by a broad candelabra and is kept spotlessly tidy. A secret door behind the vanity’s mirror accesses room #26. Amedeo Rusfusstus [AC 9 MV 12 HD 3 C], a 4th level Magic-User, resides here but chooses to keep this room plain. He carries a Wand of Detecting Magic and wears a Cloak of Shadows (as per a Cloak of Elvenkind but with more sinister lineage). He is attended by an impeccable hobbet butler, Brogo Dramwise [AC 9 MV 9 HD 1 N] (with a loyalty of 11) and has charms upon Guzaag the giant orc (room #22) and Duffr the elder dwarf (room #23). The mercenaries in room #28 are in his employ (with a loyalty of 15). Amedeo carries the key to room #30 on a chain about his neck. ROOM #26. [Treasure] Amedeo’s study contains a comfortable arm chair and a wall to wall bookshelf which is mostly occupied by obscure samples, glass wear, writing implements, and loose notes and scrolls. Theses are Amedeo’s studies. His books of First- and Second-Level Magic-Users Spells are also present; indistinguishable from a dozen other less important tomes. ROOM #27. [Empty room] A crude parley table stands in the middle of this bare room. Battered shields and arms decorate the easterly and westerly entrances. The orcs (see rooms #19 and #22) infrequently use this room to negotiate with Amedeo or his servants (see rooms #26 and #28). ROOM #28. [Monster] 2-8 mercenary fighters [AC 4 MV 9 HD 1+1 N] reside here. They are employed by Amedeo Rusfusstus (see room #26). He pays well so their loyalty rating is very high (15). However, they love to gamble and have recently lost most of their silver (again!) to the despicable dwarfs (see room #23) whom they are convinced must be cheats. They do not know about rooms #26 or #30, nor about the secret peep hole through which Amedeo occasionally spies upon them. ROOM #29. [Empty room] The mercenaries stationed in room #28 barrack here. ROOM #30. [Treasure] The door to Amedeo’s treasury is locked (see room #25). Inside is his dangerously depleted hoard which comprises a mere 2500sp in two small chests and several loose sacks. Several empty boxes imply there was more loot here previously. Amedeo has indeed spent much of his money on his research and retainers, and is well aware that he is in need of additional funds. There is a secret peep hole here that looks into room #28.
b) While anyone is in room #31, the portals cannot be opened from the outside. From the outside the four portals appear to be diagonally bisected metal plate doors which automatically snap open (Deathstar-esque), and remain open while anyone is within 20ft of the exterior threshold. The portal will automatically snap shut as soon as nobody remains within a 20ft approach of the exterior threshold. Should the players become separated with some inside and some outside, those outside must not overhear what happens inside the room! The statue in the center of the room will always be pointing imperiously toward the door the players entered by. Only after the door has shut can the statue’s upper torso be twisted (with great labor) so that it points to _another_ door, which then snaps open and remains so while there is anybody in room #31. A dwarf working the statue may perceive a nick in the mechanism when passing through south of south-west. If the statue is set pointing in this direction, the secret door to room #24 will snap open (obeying the same mechanical truths as the other portals). ROOM #32. [Empty room] A disused shrine, perhaps, overlooked by a statue of a forgotten lobster-demon. The southern door is cool to touch. ROOM #33. [Empty room] This room is unusually cold. Spiders will not enter or pursue through this room. ROOM #34. [Monster] Two green slimes [AC 9 MV — HD 3 N] are slowly conjoining in this narrow room. ROOM #35. [Monster] Both doors are locked. Tarrent and Nogrod (see #36) each have a key that fits both doors. Forcing the western door from room #41 will likely result in a tumble down the stair. The room is pitch dark and cool. 2-8 ghouls [AC 7 MV 9 HD 2 C] are kept locked in here, to be subjected to the experiments of the Black Friars; Tarrent and Nogrod (see room #36). They will surge to attack any who enter. ROOM #36. [Treasure + monster]: Tarrent [AC 7 MV 12 HD 2+1 C] and Nogrod [AC 9 MV 12 HD 2+1 C], two 3rd level Anti-clerics, conduct their blasphemous inquiries in this Frankenstein’s body shop. They are accompanied by 2-8 fanatic cultists [AC 9 MV 12 HD 1+1 C]. The Anti-clerics hope to acquire a ghoul’s power of paralysis (thus the captives in room #35) for their own evil ends. A dissected specimen lies upon a grisly slab. Tarrent carries a magical shield +1, Nogrod wears a helm of alignment change. Additionally, there are a score of small brass pots filled with silver coins; collectively they contain 1900sp. Tarrent’s book of First Level Clerical Spells is here but Nogrod does not yet possess one; he must share that of his evil Brother. ROOM #37. [Empty room] A blasphemers’ shrine, situated below an arched footbridge. Tarrent, Nogrod, and their cult (see #36) have cots here. Tarrent’s book of First Level Clerical Spells is hidden, face down, under his cot. ROOM #38. [Empty room] Blasphemous runes and signs are painted on the walls here. A stair descends to room #36, passing below the passageway south-east of room #19. ROOM #39. [Trick/trap] The door to this room is apparently locked, but it will give way rather easily. Inside is a small room with every indication of a treasury; Reaching into the room from each of the five walls facing the door is a large stone forearm proffering a sparking gem. Below these, the floor is stacked with pots of gold and sacks of silver. All told the players will estimate 10,000 coins with 3,000-8,000gp and the balance sp. It is all an illusionary trick, of course. The gems and coins are in fact worthless, gray-white pebbles which will only encumber the players. The illusion will reset an hour after being looted. ROOM #40. [Treasure] A quiet, secret chamber of wood paneled walls. The brigands at #13 have hidden their loot in a small chest in the middle of the room. It contains 800sp and 800gp. Curiously, there is a pile of gray-white pebbles–just as large–adjacent to the chest. ROOM #41. [Empty room] A strangely bare intersection. The eastern door is always locked. Tarrent and Nogrod (see #36) each have a key. Forcing the door will likely result in a tumble down the stair immediately inside and into room #35. ROOM #42. [Monster] 2-12 large spiders [AC 8 MV 6/15 HD 1/2 N] are here. Although these are Mabyagzeurg’s (see room #9) most recent batch of offspring, she is absolutely indifferent to them. As far as she is concerned, they are food. The numbers of monsters appearing assume 4-6 players. Use one-half as many for 2-3 players. Use half as many again for 7-10 players. In room #22 Guzaag carries Jitterhex; a sword +1, +2 vs men. In later iterations of the game this weapon adjusts attack rolls by +1, and damage rolls vs men only by +2. In an earlier incarnation of the game enchanted weapons performed differently in normal combat. As a 3 HD man-type, Guzaag has the Fighting Capability (FC) of three men in normal combat, and that of a hero–1 in fantastic combat. In normal combat Guzaag usually throws three dice as a man. Possessing a magic weapon promotes any figure’s FC by one man in normal combat, so Jitterhex enables Guzaag to throw four dice rather than three. Each hit in normal combat deals 1-6 hp damage. To the total damage caused to men in a combat round, Jitterhex adds 2 hp damage. In fantastic combat Guzaag usually throws one die as a hero–1. Possessing a magic weapon adds its plus to any figure’s die, so Jitterhex’s +1 enchantment will be added to Guzaag’s die. A hit in fantastic combat will usually deal 1-6 hp damage. However, versus men only, Jitterhex adds 2 hp damage for a total of 3-8 hp damage. In room #36 Tarrent carries a shield +1. In later iterations of the game this is simply equivalent to a –1 AC adjustment. In an earlier incarnation of the game, enchanted shields (and armor) would instead reduce an attacker’s HD by one; effectively reducing their number of attacks by one in normal combat, or adjusting their attack die by –1 in fantastic combat. The bearer of a +1 shield would not, therefore, be subject to any effective frontal attack from 1 HD types in normal combat. The 2 HD types would have one normal attack, rather than their usual two normal attacks, and so on.